Successfully Added 7 Inch Widescreen 160GB Media Player + DVB-T and Analog TV to your Shopping Cart. 7 Inch Widescreen 160GB Media Player + DVB-T and Analog TV. 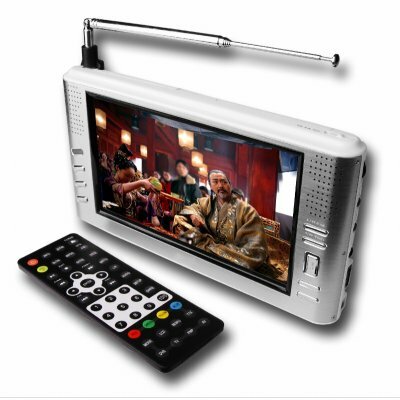 Portable digital media player with 160GB HDD memory and built in DVB-T and analog TV tuners. There is so much that is right about this system - it will do everything you want from a PMP and more. DIVX, XVID and AVI format files will all play at high quality 720x480 resolution, allowing you a wonderful portable video experience. Add to that an AV input and TV tuner with TV recording in DIVX format plus built-in 2 x 1.5W speakers and you can imagine all the different possibilities that can be had with this unit. Perfect for hard to please videophiles and high-tech product junkies, this product makes a great gift for yourself or the techie you love. Plus, with the screw base for mounting in your car, you can DIY mount the CVASQ-PD808-160 in any vehicle and have an enjoyable portable TV and digital media center. In stock and available for single or bulk quantity orders, get yours today at the usual Chinavasion low wholesale cost and with no M.O.Q. (no minimum order quantity) from the original direct from China electronics wholesaler, Chinavasion Electronics. Portable Media Player with built-in 7 inch LCD widescreen display and 160 GB of hard drive type memory. Load this unit up with all your favorite digital video files for later viewing while out and about. Important Note On DVB-T: The DVB-T digital TV standard is not available in every country or region. Please make sure to see if DVB-T is available in your region. The Analog TV function can be used worldwide.